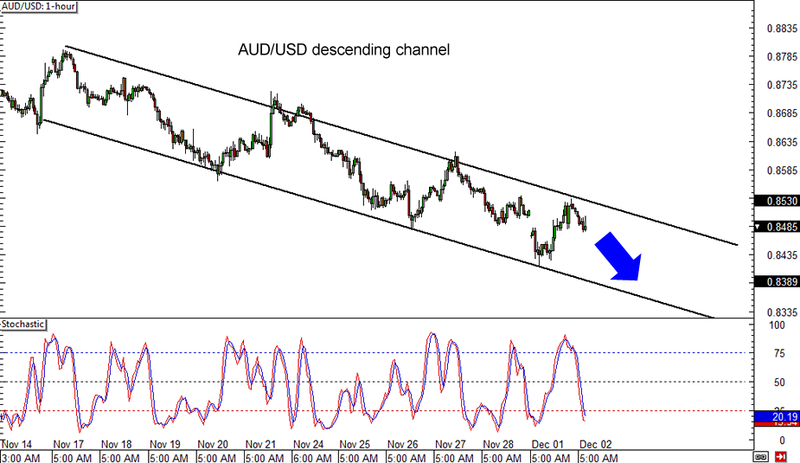 If you think the trend is your friend, then you might like this AUD/USD descending channel setup on the 1-hour forex chart. The pair just came off a test of the top of the channel around the .8500 major psychological level, which held as resistance. Stochastic is still heading down so there might be a bit of bearish momentum left to take the pair all the way down to the bottom of the channel around the .8350 minor psychological support. However, once the oscillator crosses up and starts heading out of the oversold area, buyers could return and push AUD/USD back to the channel resistance once more. Just make sure you set your stops right if you’re trading this one! If you’d rather stick with the ranges, then this one’s just for you! 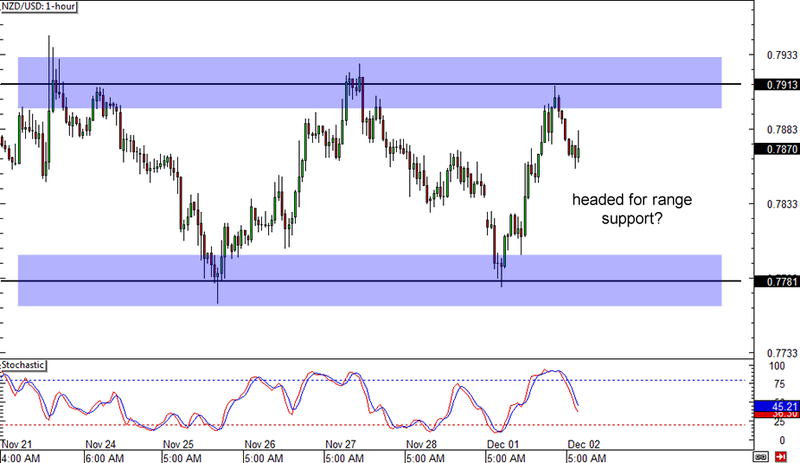 NZD/USD seems to be moving sideways, creating a short-term range on its 1-hour forex time frame. It just tested the resistance at the .7915 area and is already heading south, possibly until the range support at the .7780 level. Stochastic is indicating selling momentum anyway, so there’s a good chance that Kiwi bears might stay in control for now. There appears to be an area of interest at the middle of the range, right around the .7850 minor psychological level, which might also hold as near-term support. Watch out for a potential bounce in that region, as another test of the range resistance could be possible. 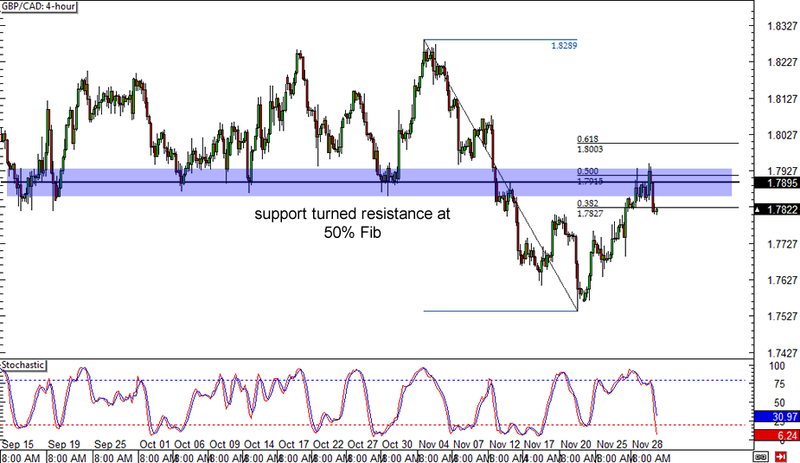 Last but definitely not least is a break-and-retest setup on GBP/CAD’s 4-hour forex chart. As you can see, the pair previously broke below a strong support area around the 1.7900 major psychological mark and fell to the 1.7550 area. From there, GBP/CAD pulled back up to retest the broken support zone, which happens to line up with the 50% Fibonacci retracement level. This area seems to be holding as a ceiling so far, with price and stochastic both turning back down. If the selloff resumes, the pair could make its way back to the previous lows or perhaps create new ones. Make sure you review our lesson on How to Combine Fibs with Support and Resistance if you’re thinking of shorting.